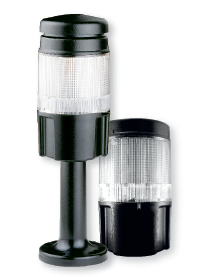 The S370 series stack light is the most advanced signal lamp available. With the unique ability to display multiple colors from the same lamp, as well as 3 kinds of lights from each color (steady, flashing, rotating) the S370 has the ability to display up to 6 simultaneous messages with the same lamp. This saves cost, installation time, and space by combining the functions of multiple lamps into a single unit.